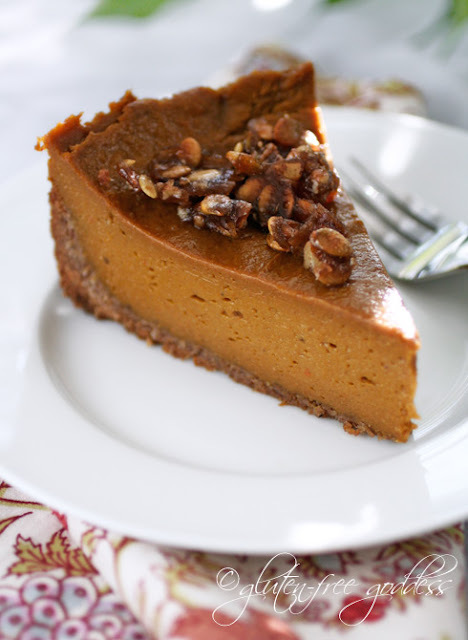 A reader asked if I could find a good gluten-free pumpkin pie for her to make this year. Of course I can! I think Gluten-Free Goddess is one of the best places for gluten-free recipes and I don't think this pie would disappoint. It has a coconut pecan crust and is topped with praline. The vegan filling is made creamy yet firm with the addition of cashew cream and coconut milk. I can't imagine anyone would miss wheat in this pie! Grab the recipe at Gluten-Free Goddess.